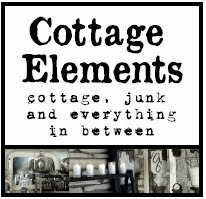 Cottage Elements: Destination Vintage Marketplace - Springfield, Ohio! Destination Vintage Marketplace - Springfield, Ohio! Talk about a road trip! Ventured to Nashville, Tennessee already this year with Sue Whitney and JUNKMARKET Style. Next destination, Ohio! Yippee skippy! I get to see all my junking peeps once again! I'll have pictures soon of the Nashvillle trip, but here's the info for the Ohio show. And if you've ever been to Springfield, I hear they really know how to do it right! 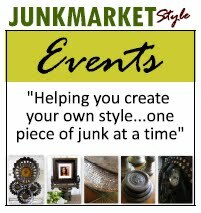 Sue Whitney of JUNKMARKET Style will be on board to help launch the Vintage Marketplace to the Springfield Extravaganza in Ohio. This was a wildly popular addition to the Music City - Tailgate show in Hendersonville, TN this past February. So popular in fact, that the show can now be found this May at the Springfield Extravaganza. There will be returning vendors from Hendersonville, dealers from JUNKMARKET Under Glass, long time participants from the Extravaganza, and some brand spanking new vintage experts. Sounds like a not to be missed combo to me!!! JMS will be present a design booth (which means she better get my rear in gear) featuring fresh ideas for your home and garden all done up JUNKMARKET Style!! We are busy working on all of the details and events so stay tuned for for the nitty-gritty! Rumor has it there may be Friday night festivities, treasure hunts, shop alongs, possibly some good old fashioned Bingo for Show Bucks, and more! Woo hoo! i seriously can't wait. This promises to be way too much fun. For those of you who have never been to the Vintage Marketplace or the Springfield Extravaganza- here a little bit of the back story. The Vintage Marketplace is a new edition to the Jenkin's shows. Think all things vintage, stylish, modern, junky and chic. This group of dealers will be housed in a series of large tents in the center hub of the May Extravaganza- May 18-20. The Extravaganza itself is a 40 year old institution featuring 2,000 vendors and over 20,000 customers. The show boasts antiques, collectibles, garden, vintage, & flea market finds. Simply put, if you can't find it here, it can't be found. The addition of the Vintage Marketplace to the Extravaganza means one thing. Take out your 2012 calendar and write the words "can't miss" on the dates May 18-20,2012. Please visit www.vintagemarketplacestyle.blogspot.com for all of the details. 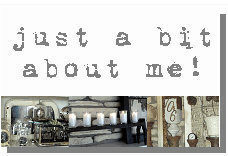 I you would, please grab the badge on the side of my blog and put it on your blog to help spread the good news. As she always says...."Create Your Own Style...One Piece of Junk at a time! At the Vintage Marketplace in Springfield, Ohio you can do just that. See you there!!! It'll be here before we know it, so I've been busy gittin'r'done for the show! Can't wait to hang out with you girls again! Oh my, I would LOVE to go to that! Don't think it's in the cards this year though. Will have to live vicariously through you!